For your Memorial Day weekend reading, here’s a review of some lesser-seen science news from Iowa universities over the last few weeks, including “addictive” cellphones, a hint at how to avoid Alzheimer’s disease and mineral water that could give you an unhealthy glow. If you’re reading this on a mobile phone, you might want to pay special attention to the first item. Iowa State University researchers say their quiz can help determine whether you have an unhealthy attachment to your pocket brain. It could be an addiction. Or not. Another ISU researcher’s study, meanwhile, has implications for the brain between your ears – the real one with hands-free access (unless, like me, you hold your head while thinking). The bottom line from his Alzheimer’s disease research may give you another reason to stop using your exercise bike as a clothesline. And finally, a University of Iowa report suggests brackish underground water produced as a consequence of hydraulic fracturing (“fracking”) for gas and oil may be more dangerous than previously thought. The ISU smartphone study seems perfectly designed to capture media attention – and it has. First the researchers interviewed nine undergraduate students and identified four possible nomophobia dimensions: inability to communicate, losing connectedness, inability to access information and giving up convenience. With those findings, the researchers developed a 20-question quiz designed to determine whether someone has nomophobia and to what degree. They tested it on a sample of 301 undergraduate students, showing that “the four dimensions were connected to the theoretical construct of nomophobia” and that the questionnaire provided valid and reliable scores. Yidrim based his master’s thesis on the results. You can read the entire document here (PDF), or skip to the questionnaire on page 89 and find out whether, OMG, you have nomophobia. (The Huffington Post item below has a guide for interpreting your results, although it’s not clear how the writer developed it.) A paper based on the research also is in an upcoming issue of the journal Computers in Human Behavior, available here for a price. 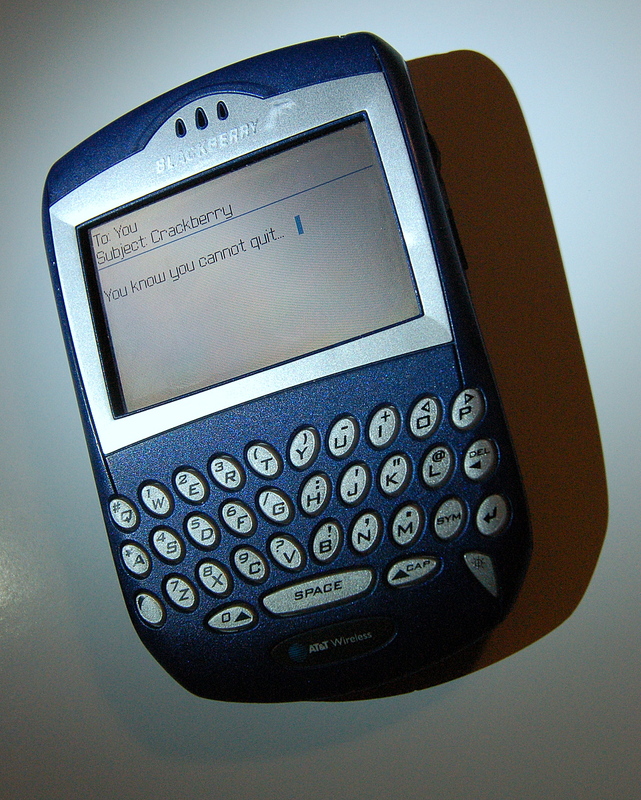 So you have a device that, 10 years ago, didn’t exist but now is so ubiquitous people joke about having an addiction. A study comes along to say, hey, maybe we are, in a sense, addicted. And hey, there’s a questionnaire that may help us determine how attached we are. And so it has come to pass. NBC’s Today Show devoted a segment to the condition in mid-May that included the hosts bantering about how they can’t live without their mobes. Websites, newspapers and TV stations from Iowa to South Africa covered the paper. Can support groups, 12-step programs and phone junkies demanding medication be far behind? I’m not making light of the ISU researchers’ work. Their study underlines the impact technology has on our psyches, our relationships and our health. But as Washington Post technology writer Brian Fung notes, it may be a stretch to call nomophobia an addiction or medical condition. We may feel uncomfortable and out of sorts when we leave our phone behind or its battery dies – we may even feel anxious and nervous – but we aren’t going to die. Such feelings usually are normal. We shouldn’t demand relief or wring our hands every time we encounter them. Certainly nomophobia pales next to Alzheimer’s, a truly heartbreaking scourge that robs people of their memories in what should be the most enjoyable period of their lives. Iowa State University researcher Auriel Willette. ISU photo by Blake Lanser. Inflammation and protein fragments called beta-amyloid (or amyloid beta, in some cases) have long been implicated in the brain cell death that causes Alzheimer’s. 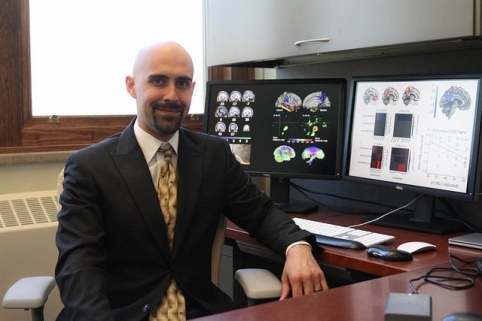 Now ISU researcher Auriel Willette has a study out showing that increased levels of another protein, neuronal pentraxin-2, may slow the brain atrophy and disabling cognitive decline associated with the condition. Willette, part of ISU’s food science and human nutrition program, studied brain scans and tests from the Alzheimer’s Disease Neuroimaging Initiative, a federally sponsored project. Willette found that participants with higher levels of neuronal pentraxin-2, the protein that regulates immune function and connections between neurons, showed little or no memory loss after two years. He also found that participants with higher levels of inflammatory proteins in their cerebrospinal fluid showed modestly greater memory loss and brain atrophy over two years. As you might guess from the name, neurons produce most of the body’s neuronal petraxin-2. The protein may help form or reconfigure connections between nerve cells, in effect clearing out debris and old connections in order for new ones to form. Here’s where food science and human nutrition comes in: Willette notes that excess body weight contributes to brain inflammation, thus increasing the risk of Alzheimer’s. Exercise, meanwhile, can make neurons more active, increasing the level of pentraxin-2. So the real lesson from Willette’s work may be one we’ve been hearing for ages: Exercise and good diet pay benefits far beyond our cardiovascular health. It could reduce the risk of all sorts of conditions. Fracking, meanwhile, has its own risks. The technique has helped fuel an American oil and gas boom, but also has raised concerns about environmental damage and earthquake risks. Fracking forces pressurized water, chemicals and sand deep underground to crack subsurface rock, releasing oil and gas. 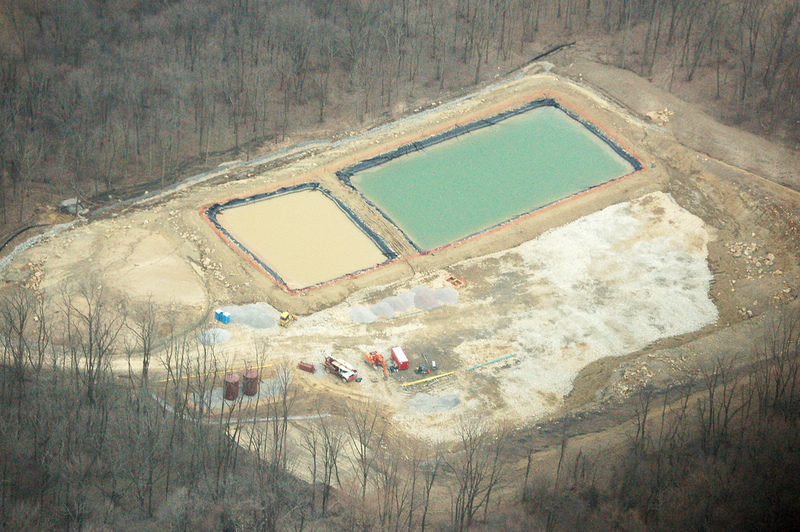 In the Marcellus formation, a prime fracking region in the northeastern United States, the process often releases stores of brackish underground water along with the oil and gas. This natural brine, which is stored, treated or reused for fracking, can carry with it radioactive elements like radon gas, radium and isotopes of uranium and thorium, a Science magazine online article by Valerie Brown notes. U of I graduate student Andrew Nelson and a team of researchers are out with a paper suggesting tests are underestimating the hazard from these radioactive elements. The tests usually follow standards from the U.S. Environmental Protection Agency (EPA), but the standards are designed to test for radium in drinking water, Brown notes. They don’t work as well with the salty water from the Marcellus Shale and other formations. …That radium-focused tests can significantly underestimate the total radioactivity of wastewater that is stored in closed containers, such as tanks. The researchers found the testing methods don’t fully measure radium’s daughter decay products, which can build up in the days and years after the briny waste reaches the surface. Radioactivity levels in stored wastewater can rise fivefold within 15 days, for example, and continue to rise for decades. As with most other research, there may be limits to the study. For one, the researchers worked only with closed containers. Radon may not be confined, but escape naturally into the atmosphere from underground water as it reaches the surface. It’s also unclear how much hazard the isotopes resulting from radioactive decay pose – or how much risk the radiation they produce presents. One thing is certain: Fracking deserves close monitoring and continued study to ensure Americans’ long-term health isn’t sacrificed in the quest for new energy sources.